Send the Gift of Baltimore, in a Box! Visit us at our retail location! Order a Box for pick up at our Store in Hampden! Need Wedding Gift Boxes for your out of town guests? Shop all of our available Box options on our website! Baltimore is an incredible place that has many things that are unique to just it. People who are from here know exactly what they are. And those that left the area miss them dearly. Baltimore boxes only include things that are iconic to this great city. 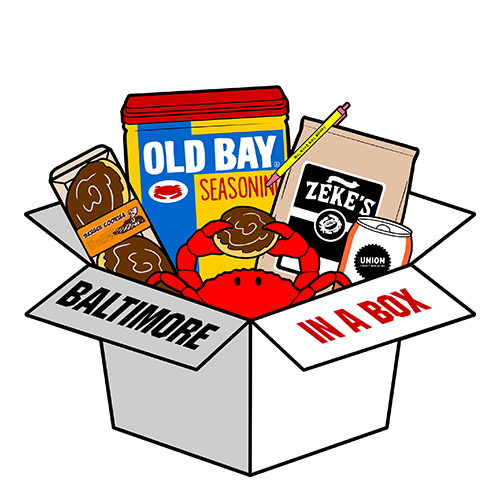 Upon purchasing you can select 5, 7, or 10 items from Baltimore to be put inside the box. We package and ship your box for free to anywhere in the USA. Click to see examples of what can go in the box. It makes a great gift for a former Baltimorean! Some boxes we have sent to customers!